It was a damp spring day in 2015 when I had my first sighting of a Gocycle. I was cycling through Hyde Park on my way to feed Jasper, my final cat of the morning, jostling for space with the other cyclists when somebody glided effortlessly past us all. It was definitely a bike he was riding, but this was unlike any bike I, and judging by the look on their faces, the other cyclists had ever seen before. As he whizzed off into the future, I realised this might just be the answer to all of my problems. Let me back up. In 2013 I had started Notting Hill Cat Company, a one to one cat sitting and cat boarding company. In the early days, the cat sitting part of the company mainly consisted of me cycling to clients houses and feeding, stroking or just hanging out with their cats whilst they were away. Although based in Notting Hill, I was unwilling to turn down work and was often cycling from to West Hampstead, Kilburn, Knightsbridge or Chelsea once or twice a day. As my client list grew so did my exhaustion. I had already considered and eliminated electric cars, finding and paying for parking in London multiple times a day does not appeal, and although I liked the idea of a scooter, they are too noisy at 6am, plus some of my favourite moments of the day are cycling through Hyde Park. By the time I saw the Gocycle in 2015, I was already looking into electric bikes and, although interested, I was apprehensive. Most electric bikes are heavy and any bike I brought would have to be carried up and down a small flight of concrete stairs at least 4 times a day. Gocycle solved this problem immediately. At 16kg it is light enough to handle but heavy enough that you feel secure on a windy day. If I’m feeling particularly fragile, I can pop the wheels off and fold it down to a more manageable size. The next consideration was range. I travel quite a distance each day and I needed an electric bike that can accommodate that. Gocycle G2 has a 45 mile range and with its App that has a variety of options controlling the effort you put in in relation to the distance you travel, it would comfortably cover my daily output . The aesthetics, I was blown away by the look of the Gocycle. Before starting my cat company I had worked in animation, so design and attention to detail have always been particularly important to me. 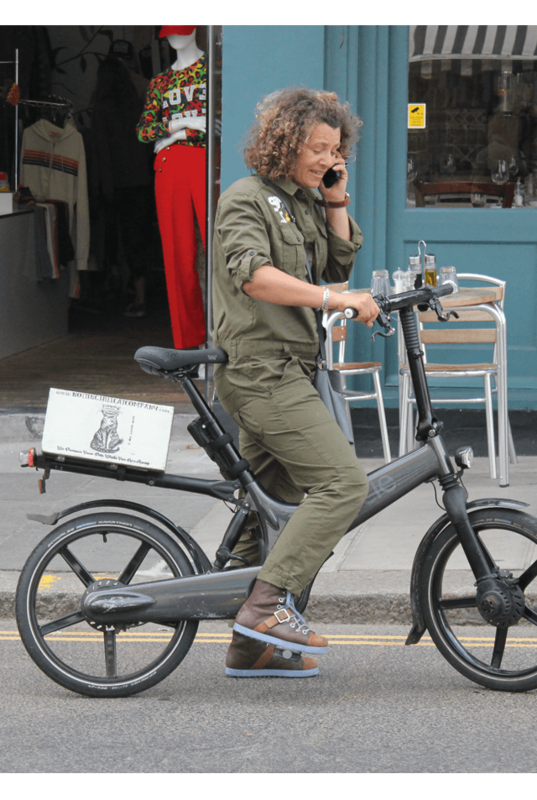 I know from experience how important good design is to a business, big or small, and with a Gocycle Notting Hill Cat Company would certainly stand out from the crowd. It is as elegant as it is sparse, eye catching without being flash and function is never sacrificed for form. The only misgivings I had were to do with the price. I’m a small business and, while it was love at first sight, I would have to feed an awful lot of cats to justify the price tag. But once I’d taken the Gocycle for a test ride, I realised it was too good to not buy it. 2 years on my faithful G2 and I have clocked up a healthy 9,335km. My worries about the initial spend proved unfounded, since buying the Gocycle my business has doubled every year. It is without a doubt the best investment my company has ever made. 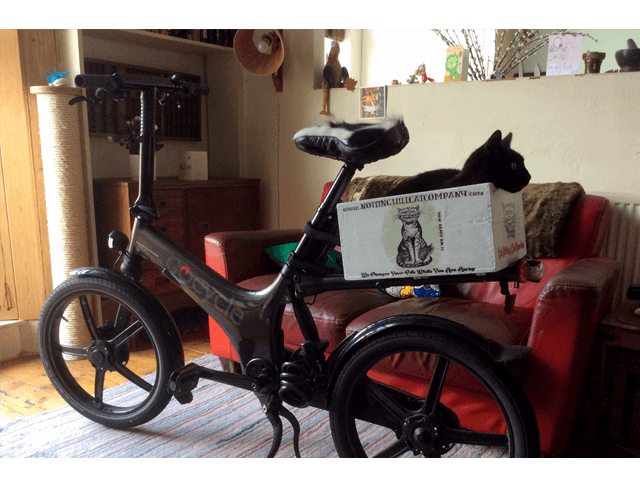 I no longer arrive at meetings with prospective clients (human or feline) a hot sweaty mess and I get stopped constantly by people interested in either my Gocycle or the Notting Hill Cat Company branded bike box on the back. It’s great advertising and most of my networking is now done on my Gocycle. Business men and women on Brompton’s catch up to me at traffic lights and curious bystanders stop me while I’m locking up. Some want technical specifications others just want to know what it feels like to ride, to which my answer is always ‘It fly’. The Gocycle is also a lot of fun and, although I now have a small team working with me, I still look forward to getting on my Gocycle everyday of the year come sunshine or rain and cycling around the local area visiting cats. Some days a 6am start is harder than others but with my Gocycle it never ceases to be fun. Whether it’s having the streets to myself on Christmas Day or effortlessly cycling past Lycra clad cyclists on an uphill stretch the Gocycle never fails to put a smile on mine or other people’s faces. My absolute favourite thing is, once all my jobs are finished and all the cats are fed for the day, I can push the little red button on the left of the handle bars and whizz all the way home. I’m planning an upgrade to a G3, the extra battery power and the day light would certainly come in handy. But, although my trusty Gocycle G2 has more than paid for itself, I’m finding it hard to let go. 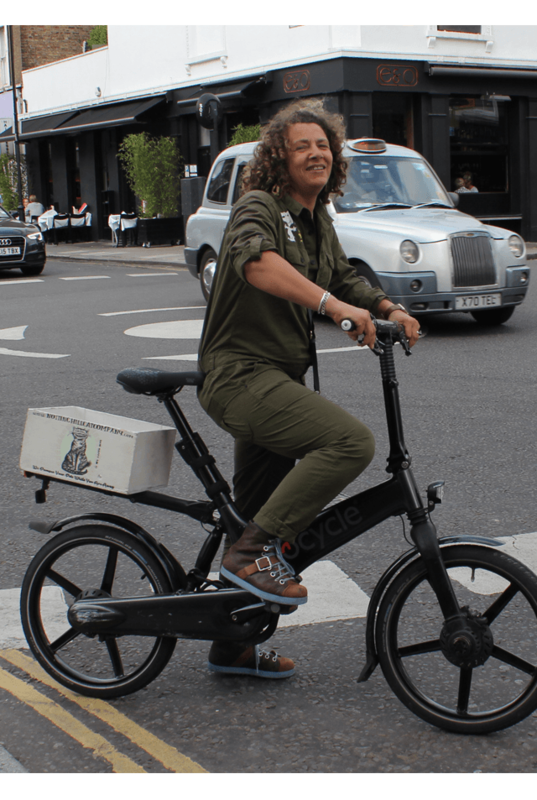 My dream is to have my team of cat sitters all riding Gocycle’s, feeling safe, looking great and sporting my Notting Hill Cat Company bike boxes. With the Gocycle GS, a more affordable version of the Gocycle, now on the market this dream could soon become a reality.